Not good at taking selfies. This is one of the few photos I took this week though. I headed to Nagoya last Friday nervous as hell. I'm not sure why but I get so nervous before concerts. I couldn't eat all day and thought I was going to be sick. Nagoya is a quick shinkansen trip from Tokyo but I've never been there before. Because you have to go from the JR East area to JR (whatever, Central?) you can't pick the cheap travel passes to go there and, to be perfectly honest, I never thought it was that interesting. Nagoya didn't prove me wrong on that. I've always had the impression that Nagoya people were a bit nuts. That was also not proven wrong. When I arrived in Nagoya, I wanted to drop my stuff off my Airbnb then head to the dome to buy goods. Easier said than done. I think they are doing a dodgy room sublet so the address details were all wrong. She did send me a doc with the directions but I'd decided to grab a taxi to save time. Big mistake. 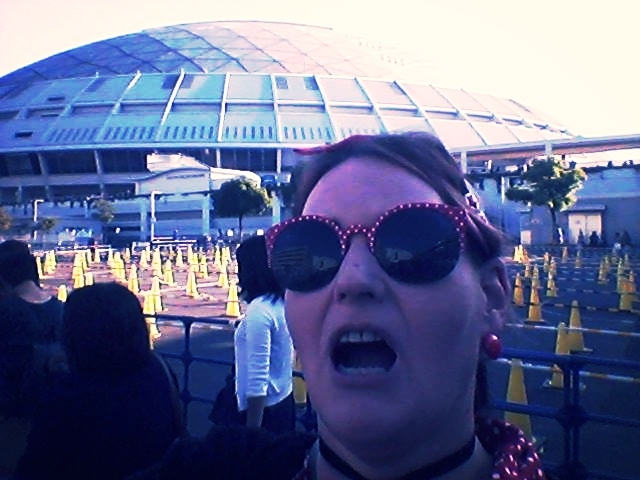 By the time I got to Nagoya dome all the limited edition Arashi masking tape had sold out! Oh noes! I was going to go back early the next day to get some but then realised that I really have no need to for Arashi masking tape. The concert was amazing. I have no words. I thought they'd never be able to top the Digitalian concert last year but they did. I'm not even going to attempt to describe it. In weird coincidences, I met another Westerner before the concert from Geelong (which is about 50km from Melbourne) and we were seated together. On Saturday, I felt sick. I thought I was getting a cold but I think it was just exhaustion from all the nervous energy of the day before. I didn't think I'd make it through the concert but once it started, I forgot all about that. My Saturday seat was right at the side of the stage so I got to see some bits really well and other bits not at all. I couldn't even see the screens that well. The bits that I could see up close made up for it though. The Saturday night crowd seemed to be a lot more fun too. Argggh, with my continuing bad luck with Airbnb, the guy I stayed with came home late Saturday night, drunk and with a chick. They had the TV on really loud and I didn't get much sleep. I am never staying at places that aren't my own apartment again. It just feels awkward being in someone else's space. So now I've moved out of Tokyo and am in Sapporo for a week. It's damn cold. The plan for the day is to get my next novel edited which might be fun before my "m" key is getting stuck!